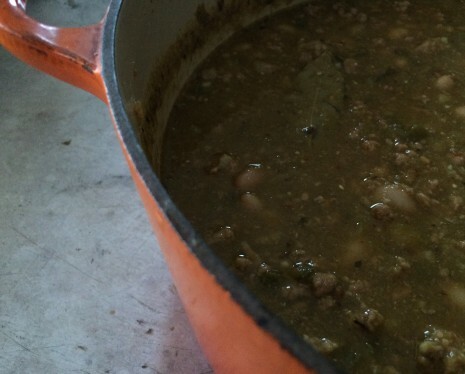 WINTER WARMTH: TURKEY CHIPOTLE CHILI | Jane Lear. Writing on Food and Travel. I’m a purist about a number of things, but not about chili. I like it with ground, cubed, or shredded meat. With or without beans. With or without tomatoes. I do prefer really good soft tortillas as an accompaniment, but tortilla chips, rice, or the spaghetti (and oyster crackers) that folks in Cincinnati are crazy about all have their place. I’m fascinated by the diversity, I guess. By its very nature, this product of various ethnicities and a timeline that spans four centuries embraces change. Culinary antecedents include a Native American buffalo stew; a Berber-influenced meat dish seasoned with cumin and garlic from the Canary Islanders who, by order of Philip V of Spain, helped populate Texas in the 1700s; and, in Cincinnati, saltsa kima, a Macedonian meat sauce seasoned not with chiles but spices such as cinnamon and allspice and brought to the Queen City by Greek immigrants in the 1920s. What really captures my imagination, though, are the untold numbers of cooks who have made this dish their dish down through the generations, from cowboy cooks and the “chili queens” of San Antonio, who sold their wares on the plazas from the 1860s until the late 1930s, to today’s cook-off champions and dedicated home cooks across the country. The legendary jazz singer and pianist, who died in 2005, epitomized Manhattan sophistication and style, whether holding court for 35-plus years at the elegant, intimate Cafe Carlyle or gadding about town with the fanciest crowd imaginable. His apartment on East 57th Street, near Sutton Place, was suitably glamorous, with a Bechstein black-lacquered grand piano, Art Deco furniture, African-American art, African sculpture, and a monogrammed Cartier silver ice bucket. When you make a stew, you finish it to taste with a few grinds of the peppermill, maybe a dash more salt, thyme, too, and you know—you just know—when the flavor is right. Making music is much the same thing. You start with a little bass, add a soupçon of treble, throw in a bit of the drum, ‘growl out’ the lyrics, and suddenly it’s okay. You’re in there swinging. Mr. Short was a experienced host, and he must have known how smart it is to have a no-fail menu, one that people find irresistible. And chili would have had a bit of unexpectedness to it. I’ll bet his guests had more fun than they would have had at a more formal do. My favorite chili recipe, a staff favorite at Gourmet, is made with turkey and rich with the smoky heat of chipotle chiles. Its green color comes from tomatillos; only (very) distantly related to true tomatoes, they have a round, fruity acidity and great body. Although this chili isn’t as substantial as a typical beefy red version, it manages to be satisfying and suave, all at the same time. Mr. Short would approve. A few kitchen notes: Don’t let the somewhat lengthy ingredient list put you off this recipe; you can find everything at a well-stocked supermarket, including tomatillos (canned are more common this time of year) and chipotles in adobo. Chipotle chiles, by the way, are red, ripe jalapeños that are smoked and dried. The fact that they’re fully mature before processing helps explain their underlying sweetness, and the smokiness gentles their heat. In addition to being sold dried, they’re also available canned in a tangy tomato-based sauce called adobo. After using what you need, transfer the leftovers to a glass jar and store them in the fridge. I often whiz them up in the blender, then use that purée to spice up mayonnaise for sandwiches or chicken salad, or stir a little into a stew or braise. 1. If using canned chipotles in adobo, purée them with the 1 cup water in a blender and transfer the purée to a bowl. If using dried chipotles, in a small bowl soak them in the boiling-hot water 20 minutes, then purée with their soaking water in a blender. 2. If using fresh tomatillos, blanch them in a large pot of boiling water 5 minutes; drain, then purée in blender. If using canned tomatillos, simply purée after draining. 3. Heat oil in an 8- to 10-quart heavy pot over moderate heat. Add onions and 2 tablespoons garlic and cook, stirring, until onions are softened, about 10 minutes. Add cumin and cook, stirring, 30 seconds. Add turkey and cook, stirring and breaking up lumps, until no longer pink, about 8 minutes. 4. Add chipotle and tomatillo purées, chicken stock, bay leaf, oregano, and about 2 teaspoons salt. Simmer, uncovered and adding more water if necessary to keep turkey barely covered, 1 hour. 5. Stir in bell pepper, green chiles, and cornmeal and simmer, stirring occasionally, 30 minutes. 6. Stir in white beans, remaining garlic, and salt to taste and simmer until beans are heated through, about 5 minutes. Discard bay leaf and stir in cilantro. Serve with sour cream and additional cilantro. The chili, without the cilantro, may be made 3 days ahead; let it cool completely, uncovered, before covering and refrigerating. It also freezes beautifully.